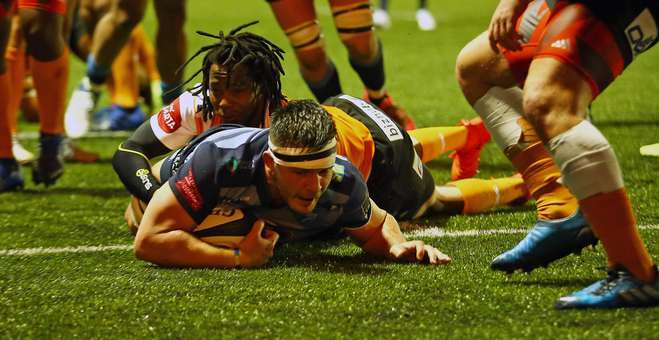 Cardiff Blues kicked off an important run of Guinness Pro14 fixtures with a win at the Arms Park on Saturday night, maintaining fourth place in Conference A and cutting the gap to third place Cheetahs. After two weeks of Anglo-Welsh Cup action there was a return to the squad for Gethin Jenkins, Matthew Rees, Nick Williams, Jarrod Evans and Owen Lane, while Dillon Lewis, Seb Davies, Tomos Williams and Ellis Jenkins were all released from the Team Wales setup. In the swirling wind and rain at the Arms Park it would be the Cheetahs, making their first ever visit to the Welsh capital since joining the league, who made the early breakthrough. A knock-on from Cardiff Blues gave them field position, and loosehead prop Ox Nche was able to drive to the line from five metres out. Fred Zeilinga added the extras for an early lead, which he would extend 10 minutes later when Cardiff Blues got on the wrong side of Ian Davies a few times in the opening exchanges. The hosts did start to come into the game though, some clever kicks from Lloyd Williams causing problems and Jarrod Evans getting hands on the ball from first receiver despite the conditions. A lengthy set of phases eventually paid dividends when the overlap was worked down the right and Aled Summerhill stormed towards the line. He was brought down short but a Seb Davies carry set up Rey Lee-Lo to pick-and-go quickly and touch down for his third try of the season. Evans kicked the conversion for a 7-10 lead after 20 minutes. That sparked Cardiff Blues into life properly, and a big hit from Lee-Lo in midfield eventually ended up in a Cheetahs knock-on for good field position. With the wind at the backs of the home side they sensed blood and it was another break from Summerhill down the right that threatened the line. Former Scarlets and Ospreys second row Rynier Bernardo was sin binned for killing the ball, and with the extra man, Gethin Jenkins opted for the corner. The throw came in to George Earle before Nick Williams ripped the ball and snuck a pass to Ellis Jenkins as he rolled away, the flanker going through a big hole in the unsuspecting Cheetahs defence. Despite the weather both teams continued to try and play expansive rugby in the build up to half-time, but predictably there was a high number of handling errors, resulting in plenty of set pieces to try and work something off first phase ball. For Cardiff Blues it was largely on the back foot in this period, but an effective blitz defence resulted in Smith and Lee-Lo securing a turnover, and Smith almost managed to cross the line on the stroke of half-time after a committed kick chase from Lloyd Williams. Playing into the wind in the second half would put pressure on Cardiff Blues in terms of accuracy with ball in hand, but a dropped high ball from Owen Lane, followed by a high tackle from Evans, gave Zeilinga the chance to make the scores 15-13 just five minutes after the break. The home side tried to get back into the game, trying to control the attacking game by using runners from the blind side rather than throwing the ball around too wide. However, Cheetahs dealt with this well and almost gained the lead when Uzair Cassiem crossed, only for the TMO to call play back for a knock-on in the build up. With neither side really gaining any dominance through their kicking game it took a special piece of play from Rhun Williams to spark the game back into life. Picking the ball up in his own 22, the young full-back spotted a gap and burst through for a carry of 50 metres plus. He was eventually brought down, but Lloyd Williams and Summerhill supported well, before Lee-Lo was bundled into touch as he tried to score in the corner. The try would eventually come though, as committed Cardiff Blues defence from the resulting lineout forced Cheetahs to touch down behind their own line. With a five metre attacking scrum, howling weather conditions and a big South African pack there was only one man to turn to, and Nick Williams duly powered over off the back of set piece. Jarrod Evans kicked the simple conversion, but the home side invited pressure right back on ourselves as the kick-off was fumbled. Cheetahs, with the wind at their backs, went all out for the try, turning down an easily kickable penalty to tap-and-go, with Cassiem eventually getting himself on the scoresheet. With the score now 22-20 and the hour mark approaching, Tomos Williams was introduced to the fray and immediately set about making an impact as he started a move that saw Lane released down the left after quick hands in midfield, before tempting Cheetahs offside with his sniping play at the breakdown. Cardiff Blues showed good intent to turn down the kick and go for the bonus point try, but unfortunately the lineout in the corner was not thrown straight. Tomos Williams would again be the architect of the attack two minutes later, bursting away down the blindside off the back of a scrum, but he just couldn't get the final pass away to Owen Lane cleanly. Another chance went begging from the lineout as Cheetahs infringed, and Evans took the chance to make the score 25-20. Just 10 minutes was now left on the clock, and Cheetahs fancied only a second away win in Europe as they started to up the pressure. Cardiff Blues mistakes, and referee Davies going to award the home side a scrum penalty only to play on when the South Africans emerged with the ball, served to give them hope. However, staunch Cardiff Blues defending, boosted by the introduction of tackle machine Olly Robinson off the bench, kept the Cheetahs at bay. Strong carries from Ellis Jenkins and Owen Lane offered welcome relief from protecting the try line, and Ian Davies evened up his earlier scrum mistake at the right time. Cheetahs wouldn't return to the Cardiff 22 until just as the clock turned red, providing some late nerves for the brave souls in attendance, but a fantastic 14-phase defensive set ensured the lead would remain, and the visitors knocked on to see the game finish Cardiff Blues 25-20 Cheetahs. Pro14 games during the Six Nations are rarely quality-filled affairs, and this encounter only went to serve that point, but the teams challenging for play-offs or European qualification at the end of the season are generally those who can grind out wins during this international period. Yet another example of the commitment shown by the players, in dreadful conditions at the Arms Park, but what was most pleasing was the flashes of quality, especially from a back three that had an average age of just 21. Add in a superb back row performance from Macauley Cook, Ellis Jenkins and Nick Williams, a scrum-half combination in Lloyd Williams and Tomos Williams who judged the game perfectly for the times they were on the field, and effective performances off the bench, and you have the recipe for a wet weather win. Rewind 12 months and we kicked off this Six Nations period with a woeful loss to Connacht at the Arms Park before two wins over Edinburgh and Benetton. I've said it before and I'll say it again, there's something special brewing in this team. Now onto a huge game against Munster next week. Come on Cardiff!